With RCI membership, week exchanges for 64,500 RCI points! Buyer may receive a title fee credit, inquire for details! Get away from it all at this award-winning vacation retreat! 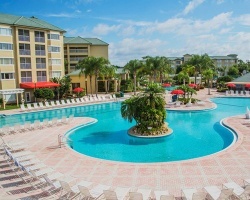 Located in the heart of Orlando Florida's world-renowned attractions area, *Silver Lake Resort* is just minutes away from the Universal Orlando Resort and SeaWorld Florida, and is just two miles from the main entrance of Walt Disney World. The exclusive Caribbean ambiance offers a relaxing environment and the vacation of a lifetime! For more information, visit www.silverlakeresort.com. *RCI Gold Crown Resort* Featuring a finely appointed 2 bedroom, 2 bath suite that will accommodate 8 guests comfortably. Usage is annual in a floating week. Maintenance fees paid annually. For more information or to make an offer, please submit the inquiry form.